Welcome back, gals and pals, to another Comic Book Wednesday. This week I want to talk about one of the most exciting things in comics this year: the return of Neil Gaiman's The Sandman with a six-issue miniseries titled The Sandman: Overture. 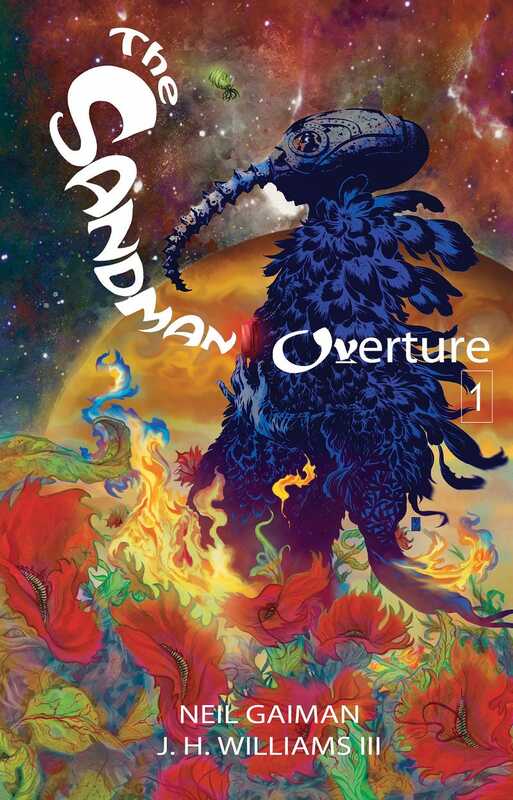 The Sandman: Overture, written by Neil Gaiman and drawn by J.H. Williams III (of Batwoman fame), is the first new Sandman material since 2003's graphic novel The Sandman: Endless Nights. Now, this doesn't mean that Vertigo/DC Comics hasn't been putting out Sandman-related material since 2003. Sandman is arguably the most successful and popular title that Vertigo represents. As far as I'm aware, Sandman has never once been taken out of print, but its success goes far beyond just the sale of the original comics. Since its publication it has inspired several spin-offs (Lucifer, Dead Boy Detectives, Thessaly, and, of course, Death), special edition publications (Absolute Sandman and The Annotated Sandman), merchandise, academic publications (The Sandman Papers and The Sandman Companion), and a comic-book adaptation of Gaiman and Yoshitaka Amano's illustrated novella Sandman: The Dreamhunters for the 20th Anniversary. "When I finished writing THE SANDMAN, there was one tale still untold. The story of what had happened to Morpheus to allow him to be so easily captured in THE SANDMAN #1, and why he was returned from far away, exhausted beyond imagining, and dressed for war. It was a story that we discussed telling for SANDMAN's 20th anniversary... but the time got away from us. And now, with SANDMAN's 25th anniversary year coming up, I'm delighted, and nervous, that that story is finally going to be told." This was a year and a half ago, and now 25 years after the very first issue of The Sandman came out in October 1988, The Sandman: Overture has graced the shelves of comic shops all over the world. The story of how Dream was weakened enough to be trapped by Roderick Burgess is finally here. Oh, guys. It was worth the wait. First, the art. The art. Oh good lord, the art. J.H. Williams III has always blown me away with his work on Batwoman, creating some of the most breathtaking comic art that I've seen in a long time. With that said, the work Williams has done on Overture makes Batwoman look mediocre. Yesterday, Comic Book Resources posted a few preview images of Overture that need to be seen. Williams really gave it his all on this book, from the layouts to the astounding pencils. Every last detail is well thought out and executed perfectly. He thought not only about how each panel flows on the page, but how each page flows into the next one. The result is something that feels organic, even when the scenes shift dramatically between tones, point of views, and locations. It gives it an appropriate dreamlike feel as you're pulled through the story, unsure of what (or who) will manifest next. Then there's the colors. Dave Stewart deserves a special mention for the incredible work that he has done on this book. Williams' art wouldn't be nearly as breathtaking without Stewart's colors. They're rich when they need to be, understated when they need to be, bright, and dark, and ten kinds of wonderful. The colors set the immediate tone for each scene. They help move your eye around Williams' delightfully unique layouts in the way that the artist intended. Colorists so often get the shaft when it comes to praise, which is always a huge shame, but anyone who leaves out Stewart when talking about this book is doing the man a great disservice. Now for the story (no spoilers). I teared up at the end of this book, not because of anything that happened in the book, but because reading this story feels so much like meeting an old friend that you thought you would never see again. This isn't a return to The Sandman or a look back at The Sandman or a revisit of The Sandman. This is The Sandman. It feels like Gaiman never left the book, like the story never ended, like the last 10 years between Endless Nights and this never happened. I'll be honest, I was really worried about this book. Don't get me wrong, I was super excited from the second it was announced, but I was still worried. There have been many, many creators who have returned to old characters and series, only for the result to be disjointed and disappointing. I think a lot of creators lose touch with their older creations as they change with their current work. This isn't a bad thing, writers change, but sometimes it just makes the return impossible. Gaiman hasn't regularly done comics for years, let alone The Sandman. It was completely possible that the strands of the story had slipped through his fingers and been lost to the ether. But it seems that just like Dream and the Endless have not left the hearts of comic readers everywhere, they haven't left Neil Gaiman either. This story feels like the very best issues of The Sandman: engaging, mysterious, magical, and just a little bit bizarre. The story opens with the dreams of a sentient carnivorous plant on a far away planet and a version of Dream as a giant flower. Something like that could only exist in this book, and I'm grateful to see that Gaiman hasn't lost his touch. It must be insane to return to The Sandman after becoming the writer that he has. And it is good. It's really good. It's down right amazing. Gaiman has managed to tell a brand new story, one that is rooted deeply in the mythology that he established but also has a life of its own. I won't say more than that about the plot (besides the carnivorous, dreaming plant) because you really should read this, not hear about it. Gaiman has been tight-lipped on what this story is going to be, and for good reason. This isn't the kind of story you want ruined for you. This is something that should be experienced, and I encourage all of you to go to your Local Comic Shop and pick up this first issue. Welcome back, Neil. Welcome back, Dream. We missed you. That's all for this Comic Book Wednesday! Who's read Overture? Who hasn't? Who wants to? Who doesn't want to? Is anyone waiting for the collected edition? Is anyone hoping they'll do an oversized edition that will match with their current Sandman library? I know I certainly am.